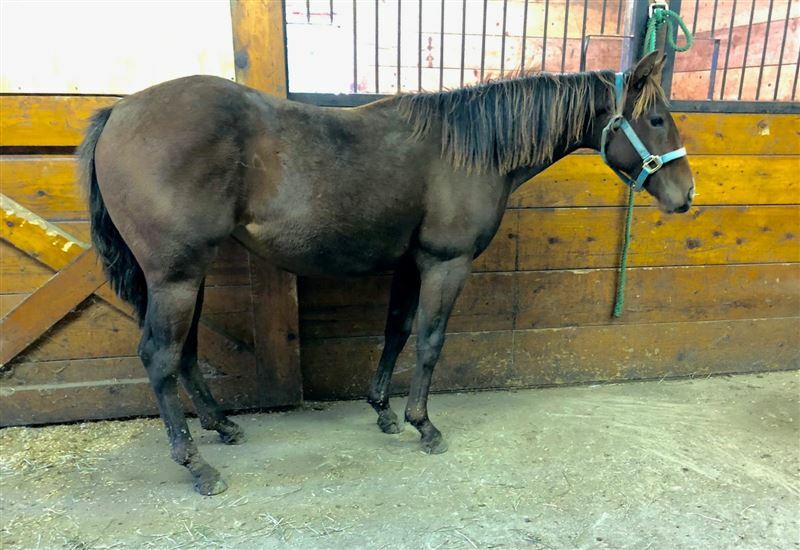 AQHA: Lucky N Rare aka "Luna" is a May 2017 bay AQHA filly by Rare Episode out of a daughter of Lucks Lucky. Rare Episode is out of the great Rare Bar's last foal crop. Rare bar was an AQHA racing world champion, track record holder with lte in excess of $263K. He has sired several 1d and pro rodeo horses. Lucks Lucky had a SI of 109, and in the Great Lakes Region has produced several pro rodeo horses that have dominated for many years. This filly is bred very similar to "Jus waitin on Luck" that qualified to last years American semi finals with a youth rider! Luna is a very sweet filly. She stands tied, great for the farrier and we did some basic ground work to start on lunging as a yearling. She will likely mature to around 14.2. Sire is 16 hands, dam is 14 hands. Here is your chance to get a filly bred to have explosive speed without the intimidating size that some of the running bred's come with. Eligible for the bbr select stallion stakes program. No trades. Video is of sire running barrels.